Disclaimer: This pen was sent to me free of charge by Levenger. Below are my honest thoughts and my honest review. I received an awesome email from Dan Marshall a few weeks ago asking if I would like to review a Levenger rollerball pen. When I said yes, I initially expected to receive a pen that I wouldn’t necessarily keep for myself. Now, all I can think about is how lucky the reader will be who walks way with this thing. The Levenger L-Tech 3.0 Rollerball is my favourite non-fountain pen ever and I’m blown away with its quality and writing experience. The quality starts right out of the gate. 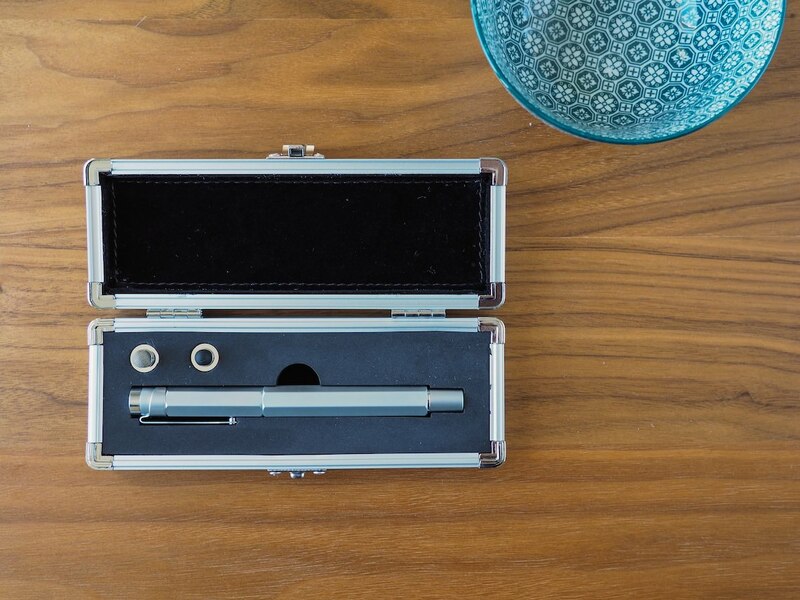 The L-Tech 3.0 comes in a classy briefcase-like case that mimics the design of the pen. 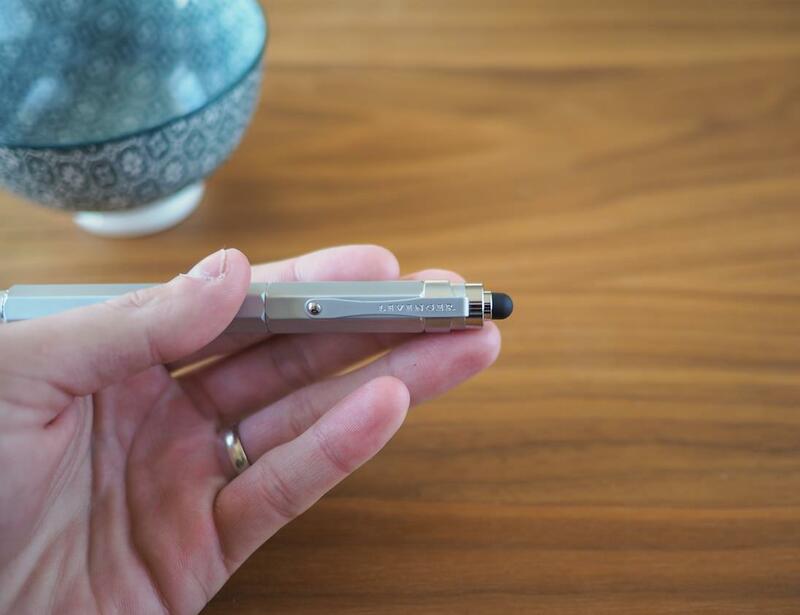 Inside, you’ll find the hefty pen, a Levenger refill and two stylus tips. You can rest assured your Rollerball is protected inside this case. Lifting the pen out of the briefcase was slightly more difficult than I expected — this is a heavy pen. It’s not too heavy, mind you. Just right actually. 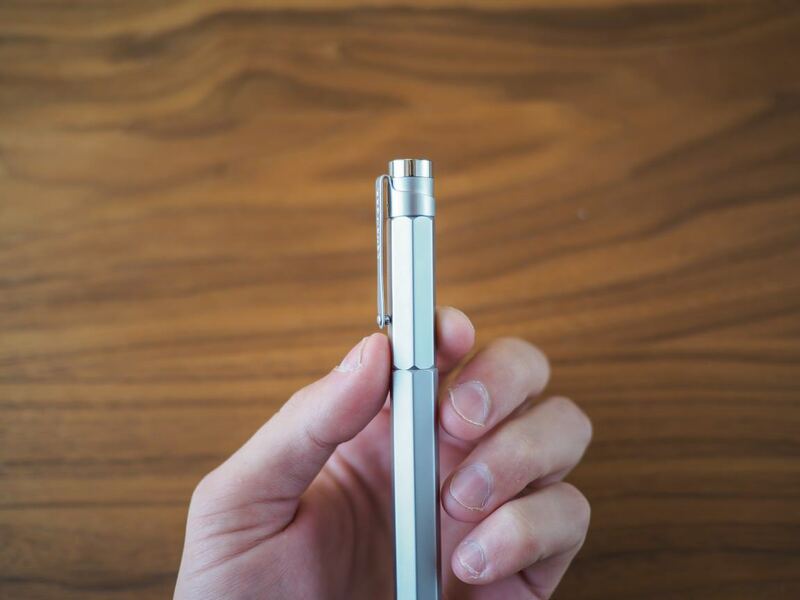 The L-Tech 3.0 feels indestructible and I doubt I’ll ever forget this thing is in my hand. 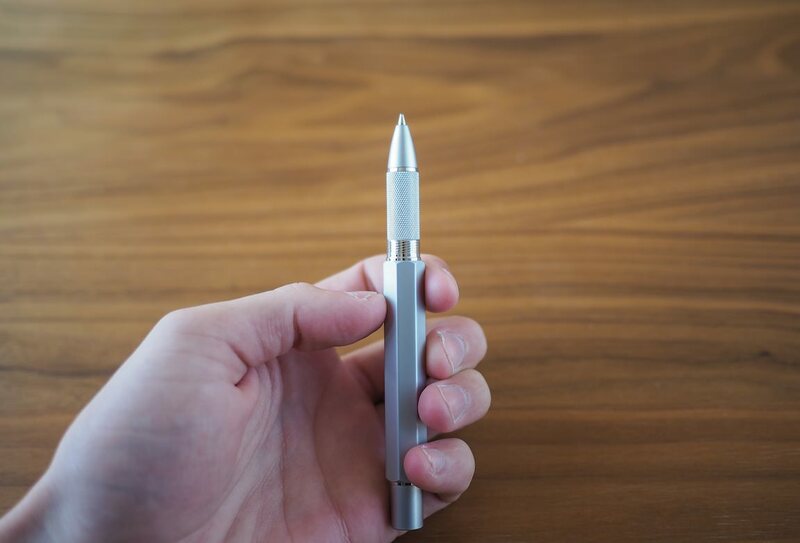 Its weight alone tells you that this pen was designed with quality in mind. 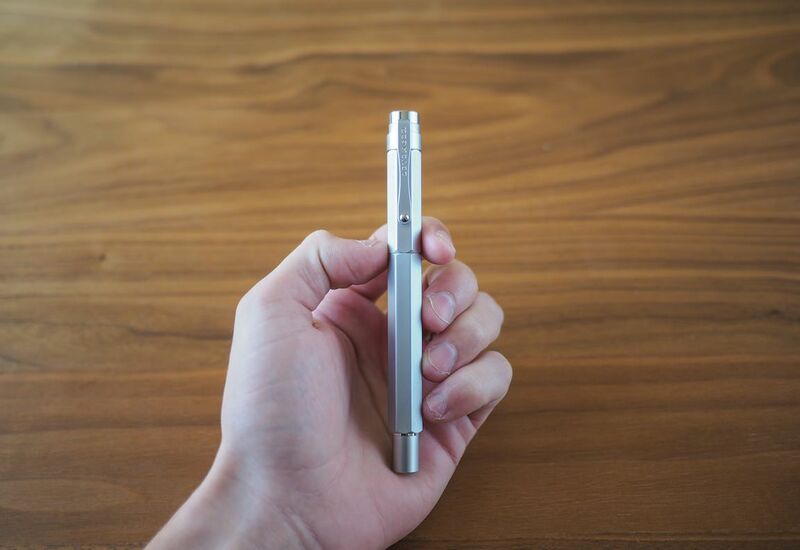 The top and bottom of the 3.0 Rollerball are flat and round. 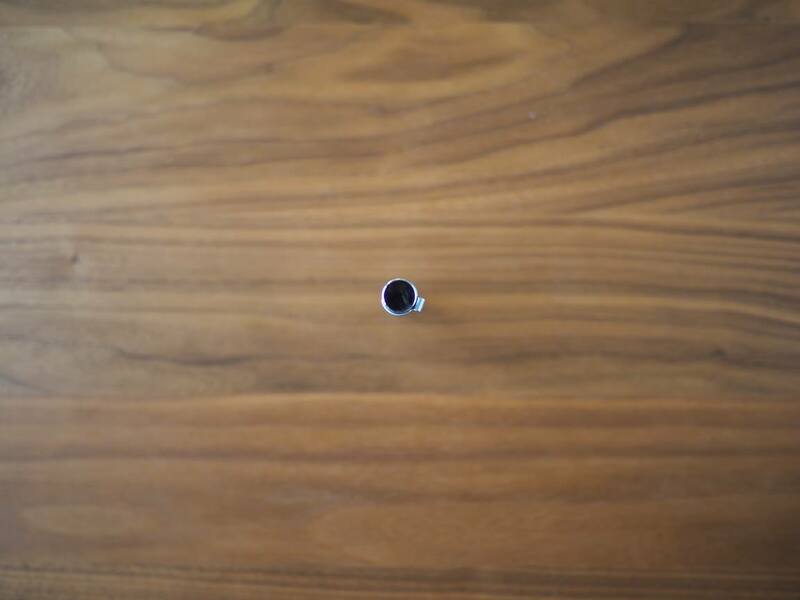 The hexagonal brass body is sharply contrasted with the round end. 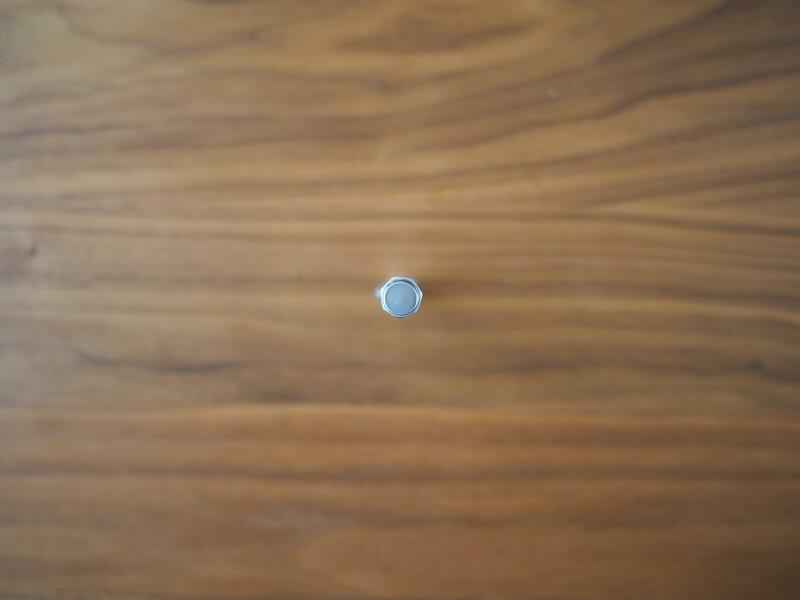 Further, posting the cap is easier because of the rounded end. Overall, a smart design decision. The shiny fineal at the top of the cap is very shiny and I felt worried about scratches and wear and tear when I was shooting these photographs. The chrome-like cap certainly tops off the brass design. 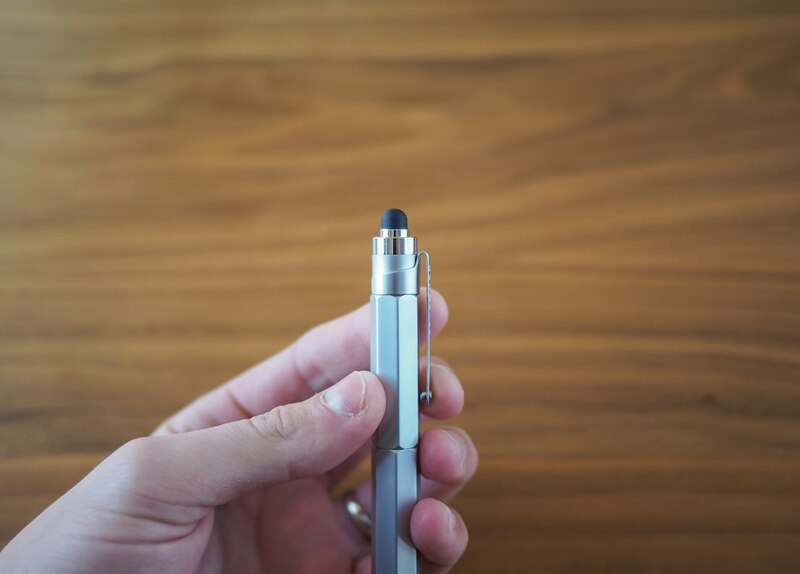 Perhaps surprisingly, the L-Tech 3.0 fineal can be unscrewed and a stylus tip for tablets and phones can be screwed on in its place. 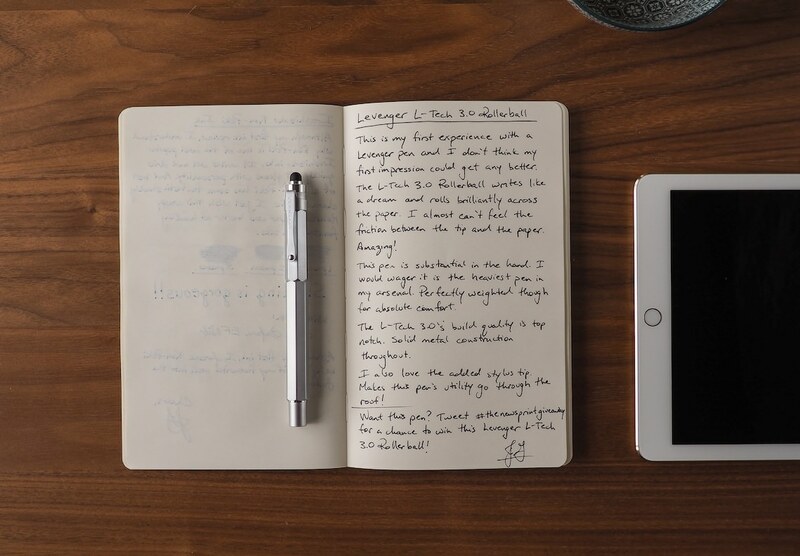 This adds to the utility of the pen beyond its standard writing purpose. Despite the added utility, I’m not sure if I truly like the stylus tip. 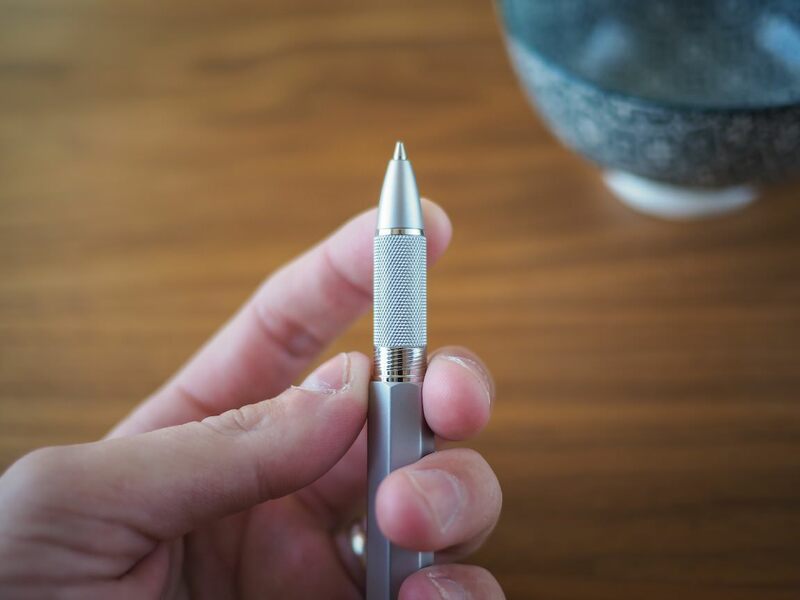 The pen as a stylus is comfortable to hold and comfortable to use, but the blunt end (like many other styluses) makes precision difficult at the best of times. I rarely use Paper on the iPad, but I fired up the app and tried out the Levenger stylus for good measure. I am able to write more legibly than I can with my fingertip, but I went into the experiment expecting better performance. 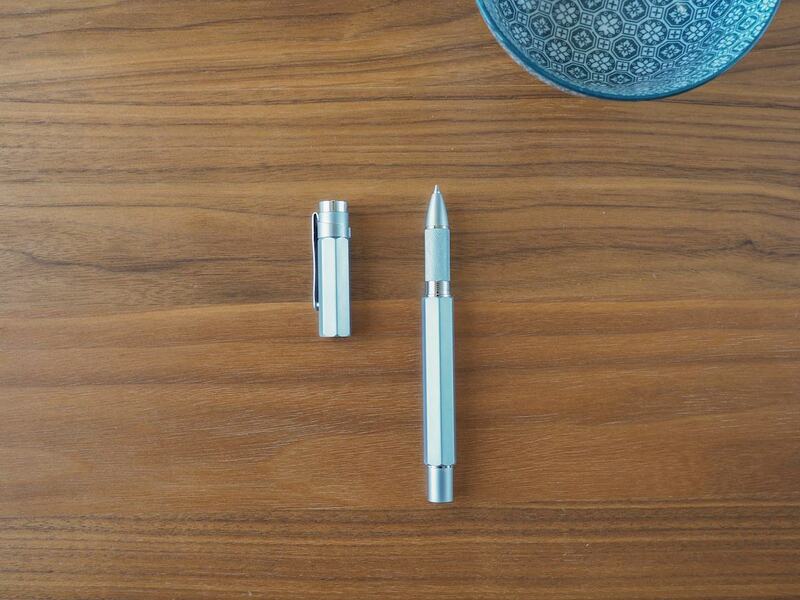 At the end of the day, you’re getting an actual rollerball pen here, not a stylus. The rest of the cap, and the clip in particular, continue the quality trend. The Levenger name is inscribed elegantly on the clip and the clip itself is sturdy enough to prevent it from sliding around in your shirt pocket. Best of all, when the cap is screwed on fully, the hexagonal body shape is flush with the hexagonal cap shape. These little details mean a lot to me and I’m glad to see Levenger went the distance. Unscrewing the cap reveals the machined grip section and tip. I’ve become a big fan of screwed on caps these days. There’s no questioning whether the cap is on snugly or not and throwing screw-on capped pens into your bag is more comforting than a friction cap. I was immediately reminded of the Zebra F-701 when I unscrewed the cap the first time. The machined grip section is a joy to hold and looks brilliant in the process. I like how the circular design found at the end of the barrel ends up extending into the grip section. The aesthetic gives off the impression that there is a cylindrical pen inside the hexagonal body. This is a classy design from top to bottom. 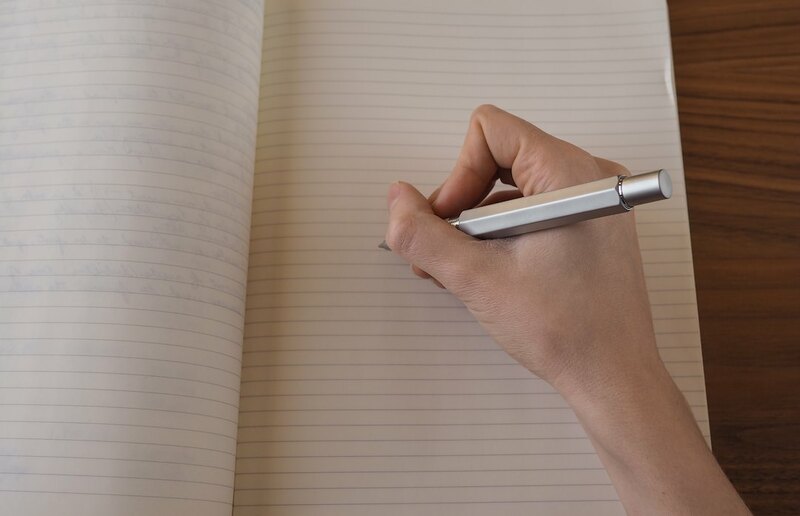 Due to the weight of the pen and its large cap, this pen is not suited for posted writing. My hands are average size and I find the pen to be very off-balance when rested in the webbing between my index finger and thumb. Unposting the pen allows the pen to shine. 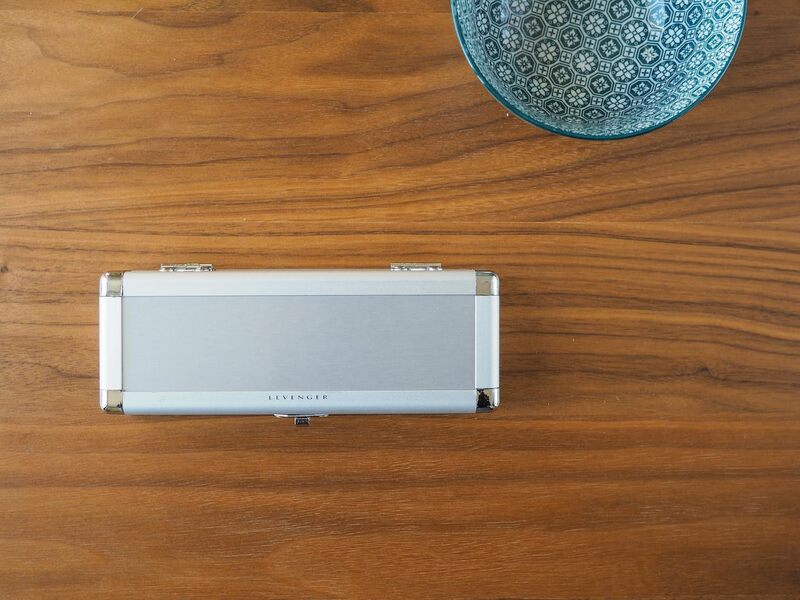 The hexagonal body has been machined to have soft edges and doesn’t dig into your hand. The machined grip section is comfortable to use over long periods of time. I can’t stress the heft of this pen enough. The L-Tech 3.0’s weight is perfect. It isn’t heavy like a brick, nor is it too light to forget about. 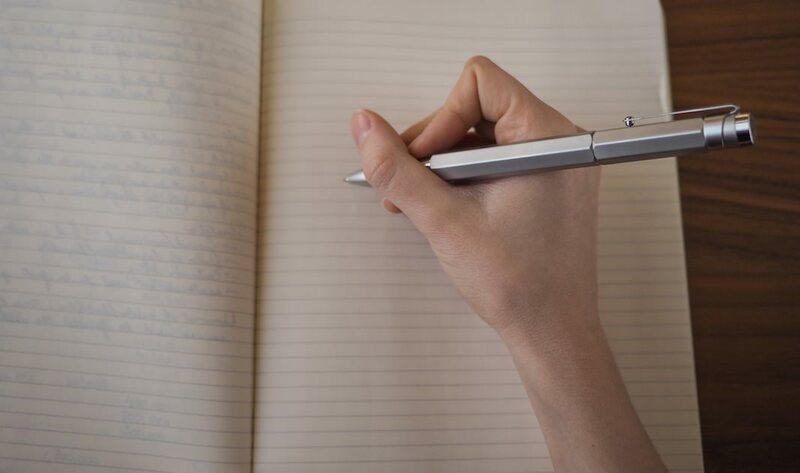 This pen is weighted just right for unposted writing. Despite all the ergonomics and weight specifications, the Levenger L-Tech 3.0 Rollerball excels where it counts. 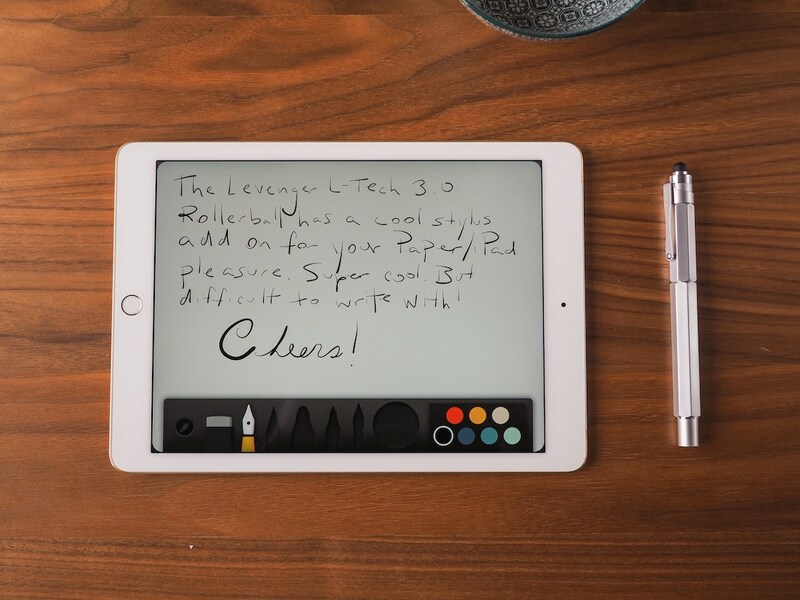 This rollerball rolls black ink onto paper smoother than any pen I’ve ever tried. In fact, there are times where it feels too smooth. 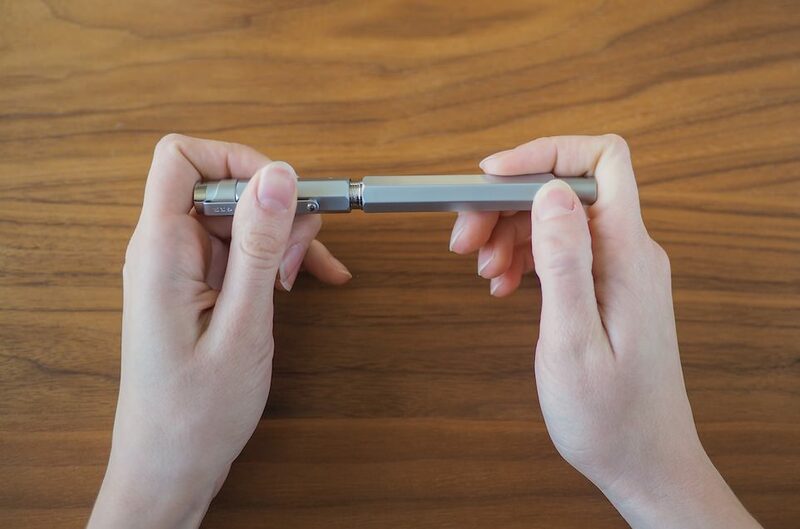 The 3.0 Rollerball glides across the paper so smoothly that you feel like you’re writing on plastic. I personally like a little bit of friction when I write, so it doesn’t fit my wants perfectly. Either way, there is no doubting that this is the single smoothest pen I’ve ever written with. 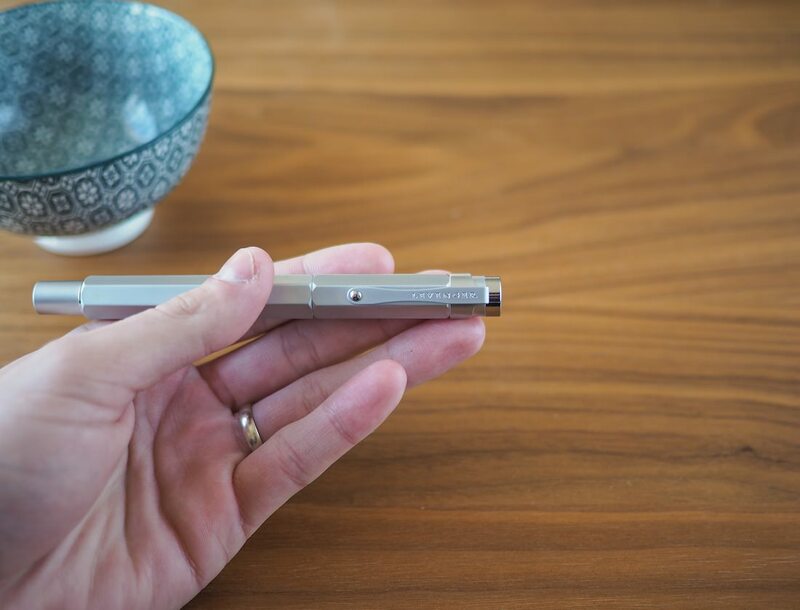 I started this review process thinking I would be giving away a solid $80 pen as a prize for a lucky reader. Yet, I’m left feeling that I’m giving away more than an $80 pen here. The Levenger L-Tech 3.0 Rollerball is easily my favourite non-fountain pen and it even passed the now famous Wife Test. If Jaclyn loves this pen, so will you. Now, for the first time ever on The Newsprint, I have a giveaway to announce. This Levenger L-Tech 3.0 Rollerball was sent to me for purposes of review and giveaway, so I’m going to do exactly that. To enter for a chance to win this pen, head over to Twitter and tweet the hashtag #thenewsprintgiveaway. While you’re at it, follow @thenewsprint to stay up to date on the contest. If you feel like being awesome, let your friends know about the giveaway and get them signed up. The more contestants, the better. The contest will close on Wednesday, November 12 at 11:59PM CST. At that point, in the same way Brad does it on The Pen Addict, a random number will be generated at random.org and will determine the winner. I’ll post the results Thursday morning and the lucky winner will have a week to get in touch with me for shipping. Thanks again to Dan Marshall for the incredible opportunity and this incredible pen. One lucky reader is going to be blown away.